St. Louis, with its large Irish population actually has two St. Patrick’s Day parades. The Downtown parade is considered the more commercial parade and has large floats. 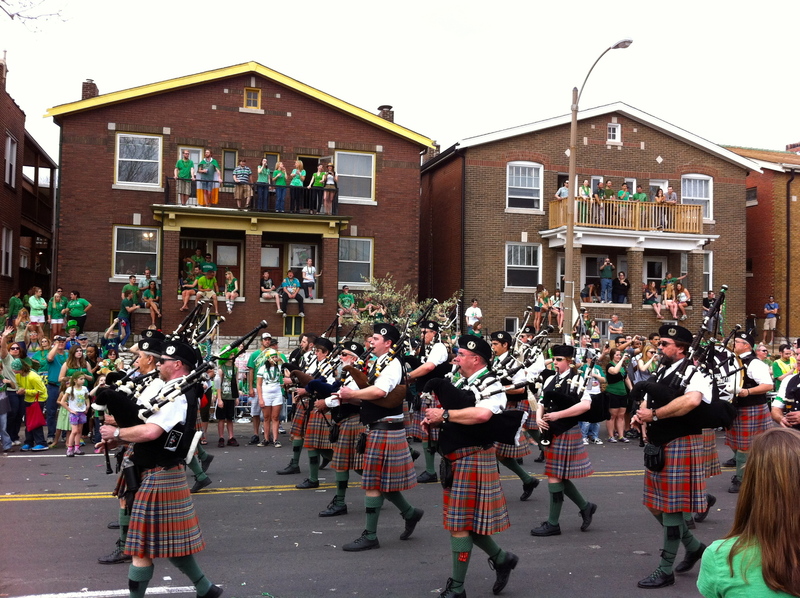 The Dogtown parade is held in the Irish neighborhood of Dogtown and is considered to be the more genuine parade. Most of the floats are put together by Irish “clans” or extended families with the same last name. While the Downtown parade is on the Saturday closest to St. Patrick’s Day, the Dogtown parade always occurs on St. Patrick’s Day itself. Occasionally, the two parades occur on the same day. Having already been to the Downtown parade, I decided to give Dogtown a shot. The Dogtown parade marching on. I arrived at the parade around 11AM and everyone was decked out in green. The atmosphere was very much like Mardi Gras with people partying in houses overlooking the parade route. The parade itself started at 1 and lasted about 2 hours. However, about 90 minutes in, a heavy rain started and the party abruptly ended thus giving a literal meaning to “raining on my parade”. Although the walk home was incredibly wet, the party atmosphere in Dogtown made the event well worth it.